I suffered a moderate brain injury when I was 21 years old, a year before I went to law school. I was thrown from a car and was surrounded by ambulance attendants when I woke up. Despite the obvious, when I got to the ER, they cleared me for a cervical injury and then released me. What was missed in my discharge instructions was the most important element in surviving a brain injury, a warning of what was ahead. I didn’t discover how much pathology there was in my brain until an MRI done in December of 2013, 38 years after the fact. 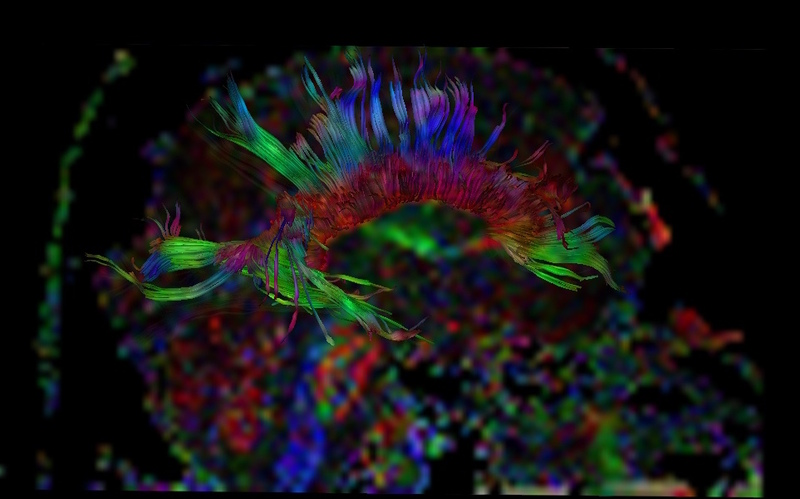 Shown here is MRI image of the author’s brain, showing a clear coup/contrecoup damage pattern. The argument exists that had I known I had a brain injury, it might have held me back – that with a proper brain injury diagnosis, I would have lacked the confidence to have gone to law school. As neuropsychologists are fond of saying: don’t label the injured person with a brain injury. So was I better off not knowing? Of course not. While a snapshot of me at 60 is highly consistent with what my high school history teacher might have predicted, what is missing in that macro analysis is the ordeal of the year after my brain injury. In a matter of a few weeks, I gave up my chosen profession, lost the relationship which likely would have led to a long term marriage and was mired in the deepest kind of despair. Had a doctor simply told me I had a brain injury and that I needed treatment, I would have avoided the dire consequences. I graduated from Northwestern University six weeks after my injury and went off to start my career as a reporter on a small town paper in Florida. That job was not beyond my pre-injury capacity. I had been Sports Editor of the Daily Northwestern, was a graduate of the Medill School of Journalism. Yet I was completely incapable of handling the pressure of a full time reporting job. What I had the most difficulty doing was initiating story ideas, particularly under deadline pressure. On my second day in my career as a journalist, I was extraordinarily tired, confused as to what to do next and simply walked into the editor’s office and quit. In the weeks between my accident and the end of my journalism career, I was extremely volatile emotionally. I was in a long term relationship with a woman who loved me but couldn’t understand my irrational jealousy and extraordinary dependency. If some doctor had offered her a simple explanation of what was going on, she would not have given up on me. If a doctor had told me I wasn’t ready for full time employment, she wouldn’t have let me go. If she had insisted, there is no chance I would have left her. But at the time for the critical decision to take the job or stay with her, I had lost my ability to make those kind of choices. When the editor told me it was time to move to Florida, I allowed him to choose for me. Three months later my life as I knew it was over. I had no career, no love life, no respect from even my closest friends. I was shunned by the university community where I had excelled. My life was delivering newspapers on a paper that would no longer have my writing. What saved me? Almost entirely by luck, on the last day before the deadline to take the LSAT, I got the inspiration to become a lawyer. Preparing for the LSAT gave me focus. As my primary problems were not cognitive, I did well enough on the exam that law school was a viable plan. The LSAT gave me a bridge to a different future. Yet excelling at the LSAT did not indicate recovery. I continued to struggle with motivation, initiative, relationships for the whole next year, even my first semester in law school. But law school helped, lots of aerobic exercise helped and by 18 months after my injury, my accidental recovery had reached the point that I was achieving at baseline levels. Why Take a Chance on Accidental Recovery? My recovery did not need to be accidental. I could have gotten treatment. I could have saved my writing career. If a caring doctor had simply told the person who cared for me the most, why I was so different, she would have kept trying. Had someone told her – told me – that there was a hope, my life would not have been hanging on the abyss for more than a year. By losing that relationship, I lost my support system at a time I desperately needed it. The most significant risk factor after brain injury is not a cognitive failure, but neurobehavioral and mood problems that can put the survivor at cross purposes with family, work and law enforcement. The cumulative total of all those issues melting down at once can push a person to suicide. Surviving a brain injury doesn’t happen if you wind up dead or in prison. I got the glimmer of hope I needed from the LSAT, but only in the nick of time. Brain damage changes lives, but doesn’t have to doom a future. Based upon longitudinal outcomes, I have had a miracle recovery. But the chances of a surviving a brain injury – of having a lifetime of recovery – are infinitely greater if one knows what it is they are recovering from. I could have started that recovery on day one. I shouldn’t have had to wait 39 years for someone to tell me what happened to me. For more on my struggles after my brain injury, click here.